When they first thought up a name, Cults, then a bedroom-based indie band from New York, never quite expected that the very name would eventually come to personify the band. But now it’s more than a year later, and that’s exactly what happened. Where Cults first began as an art project of Madeline Follin (vocals) and Brian Oblivion (most everything else), it has now developed a cult following of its own. The two of them, natives of California, were attending school in New York – Follin at the New School and Oblivion at New York University, when they first began to write music together, initially releasing their debut EP on bandcamp. But almost immediately they began garnering attention from the music world, and were faced with the decision of trying to finish their degrees and juggle a music career, or commit themselves full-time to the music. “We totally dropped out,” Follin said, giggling unabashedly. Since then, it has been an almost non-stop journey for the two, who have consistently been on tour – first in support of the aforementioned EP, and then to push their self-titled full-length, which came out in June. “It feels like forever,” Oblivion chimed in. But it’s that determinacy to which the two also attribute their success. “[We’ve been] working really really hard, working every day,” Follin said. In fact, this idea of doing things in one’s own way is part of an underlying theme of the songs on the album. 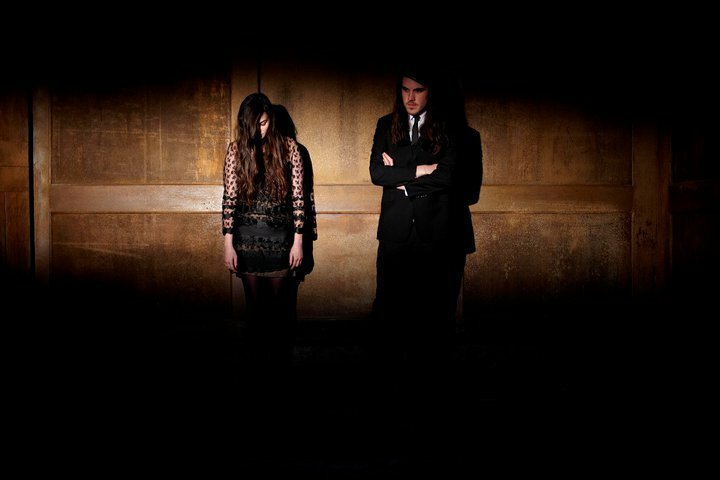 But while both Follin and Oblivion are musically and lyrically on the same page, they shared that songwriting is usually a solitary process for Cults. Instead, Oblivion comes up with the basic musical structure of a song, and then passes it on to Follin, who creates something out of the feeling the song evokes. “It’s like, usually pretty evident once the song is done, what the song should be about,” Oblivion said. He laughed, likening the songwriting process to making movies in reverse. “You set up the camera and like, get the right shot, and then, like, make up the dialogue,” he said. But it works for them, because he doesn’t have to think about writing a song around lyrics, whereas she doesn’t have to generate lyrics out of nothing. “We’ll both just kind of, like, inspire each other,” Oblivion said. Although the band is still on tour, already they are working on songs for a follow-up album, which admittedly has a bit of a different vibe – perhaps more complex, but definitely more easy-going. It’s also something to look forward too, because as much as the two love touring – especially with their companions who make up the live band – it does take a toll on them. Instead, if she had to choose, Follin prefers recording and mixing the music. “It’s the most fun,” she said. This entry was posted in Interview and tagged American, Cults, Feature, Interview. Bookmark the permalink.